I don’t believe in Politics or Politicians just like I don’t believe in Santa Claus. I see politics as theater and politicians as actors at best or puppets at worst. Well paid puppets I might add, some of them are, but when it comes to Ron Paul I have to say my heart goes out to him. I have watched him so many times on C span pouring his heart out about the real issues that we face today to mostly blank stares inside the beltway. He is the only politician that seems to be awake and not on the payroll of the corporations and special interest which is absolutely shocking to me. It’s hard to believe he has stayed alive this long in the “District of Corruption”. Like Michael Tsarion likes to point out , as long as there is a government on this planet ,we can never be truly free. Although I realize that , if we have to put up with some form of organizational body to organize and run the affairs of society for a while longer , at least until the planet grows up , then Ron Paul is a light in the darkness. I see Ron Paul as a model or prototype if you will , of the type of people we would want in charge of running our affairs. A municipal caretaker would be someone who truly enjoys serving others for the benefit of all. Of course we will need to take all of the profit motivation out of it so any greedy corrupt types would not find fertile ground again. I know this all sounds like fantasy but hey we have to dream. Ron Paul is truly a patriot , an American who is trying to stand for the right causes, it will be interesting to see what happens in 2012 since he says he will be running. 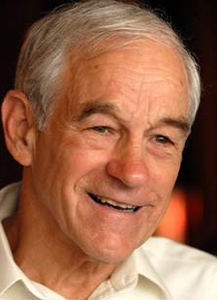 Can you imagine a president standing up against the federal reserve, to actually try and shut them down, a president who publicly declares that the CIA is the biggest drug dealer on the planet, these are all Ron Paul’s perspective. All I can say is grab some popcorn and watch the movie , hey if he actually gets that far , I might even vote for him and I have never bothered to vote in my entire life simply because I don’t see the point. I have never fallen for the whole left right paradigm distraction. Why encourage them right , but Ron he seems genuine , something we haven’t seen in a very long time , if ever . Check out the books below by Ron Paul ! In this Recent 2011 video Ron Paul voices his disgust with the newest upgrade to the “Patriot Act “, all I have to says is Patriots Beware. Here is that classic public speech where Ron Paul Talks about the CIA’s drug running and the illicit Federal Reserve , bless his heart this is classic Ron Paul , he’s got stones I’ll give him that. In his speech to the Institute of Politics, Ron Paul tells the audience “The war on Drugs has killed more people than drugs”. Wow ! Ron Paul is way to smart to be president . Well maybe 2012 will be the year the American People get smart and wake up, gonna be a hell of ride people.